Plastic bells can be useful. Plastic bells make wonderful accents for a wedding They offer durability and versatility for almost any matrimonial occasion. Wedding bells made of plastic can embellish a room, gifts, or the wedding cake. Finding these decorative bells requires a little resourcefulness, but you can find the perfect wedding bells for your special day. One of the most viable options to consider in searching for these durable wedding decorations and favors is your local craft store. Some online craft retailers offer the plastic accents as well. Popular craft stores feature an assortment of plastic wedding favors and decorations but few have bells. Small retailers may be able to work with you by making special orders of wedding bell favors and decorations especially for your occasion. Many of the larger craft stores feature metal, porcelain, crystal, and glass bells because these materials are ideal for creating lovely ringing sounds. Plastic offers durability and versatility but the material is not ideal for creating the lovely chiming sounds that are closely tied to wedding ceremonies. Shopping for arts and craft supplies online is a great approach to finding unique items. A seemingly endless number of sites offer wonderful options. It helps to be a little creative in your search when it comes to these plastic wedding products. While the aforementioned online resources offer some selection, one really stands out from the rest. Oriental Trading features a number of plastic wedding bells to consider. Some are playfully casual while others are elegant and formal. Wedding bell clappers are informal, offering a chance for guests to applaud the newlyweds. The clappers are personalized and they make wonderful wedding reception favors, particularly for a very informal event or for children. The site also offers interconnecting wedding bell lights that offer soft illumination for a formal affair. The bell-shaped lights are arranged in pairs, well spaced for a warm glowing effect. Most online resources feature plastic bells that are not necessarily designed specifically for weddings. 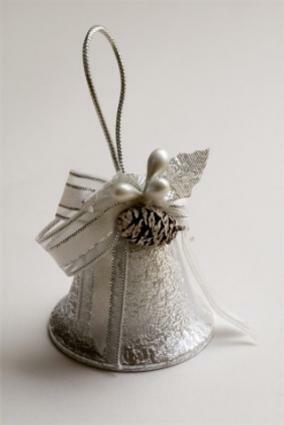 Christmas ornaments and lights are great examples of bell-inspired accents that can suit a wedding decorating theme. However, these products are great selections if you take a creative approach in your use of them. Plastic wedding bells may not be the best for ringing, but they can be fun and creative accents to wedding decorations and favors if used appropriately. Once you have found the bells you'd like to use, enjoy ringing in your creativity to design fun wedding details.